Which video is it guest ji? Looks like the owner has pulled it off their youtube channel. I can't remember where it was from. Very good lecture on how to meditate on the inner sounds leading to anhad sounds, which side you should meditate and why, what types of sounds you hear etc.Basically what we have been discussing in this thread. Would the headphone idea still be useful if you're focusing on gurmantar? I tend to switch from the sounds back to gurmantar throughout my meditation. I don't know if the headphones would cancel out the sound of your voice too. I think the ear plugs suggestion is for when your only trying to listen to the internal sounds. I wouldn't use them if doing jaap of listening to your own voice. They are a good idea when doing mental jaap with concentration. My loves to lock on to the ticking sounds made by clocks on our wall. Annoys the hell out of me, that I have to either go and remove all the clocks or pull the batteries out. wow great speaker, I am actually listening to his hindi version of the video now ? I guess when one seeks the path opens up itself. ​I'm in the same boat when it comes to the tiking. I've gone to the extent of getting rid of all clocks on my upper floor and replacing them with digital clocks. Is there anyone here who can listen to multiple sounds at once? For me it's just one sound at a time. They change during each session but I have no control over which one I'm listening to. I just tried the technique with ear plugs for the first time for 15 minutes. Mostly it was dominated by the breath sounds, followed by a light lub dub heart sound heard intermittentl, and rarely a chingggggg... sound not really in grasp. It felt a little bit claustrophobic, but mainly because its hot and was trying in the noon hours. Will keep up with it during morning hours, and lets see how it goes. Some good Q&A in this one. The video about the sounds above is real good, he's giving the right info about the anhad naad and how it goes central while trying to catch the more subtle and subtler sounds in steps. I've been using ear plugs lately because it's been real hot for the last month....and the ceiling fans have been going 24/7. It took a while to get comfortable and used to them but now I feel more relaxed with them and can just shut of the external noise in an instant. Funny thing is that on many occasions the internal naad gets so loud and clear that when I take them out it all quietens down!.....it's like the opposite effect in the sense that using them turns up the internal noise volume and dampens the external noise and it's more like just 'switching' from hearing internal/external noise--->>internal noise only. I was so confused (even little bit still now) on this concept of panch shabad.With Maharaj's kirpa I just found this.It's a short story about Gurmukh pyaarey Bhai Randhir Singh and we can learn ,we can make our doubts clear. Dhan Guru sahib! Dhan Guru sahib's Sikhi!! Radhasoamis and Yogis claim that the Anhad Shabad are 5 in number and they use Gurbani Shabads containing "Panch Shabad" to prove their point that there are 5 kinds of Anhad Shabad. The word "Panch" also means superior or great. "Panch Shabad" actually means superior or celestial Shabads that Gurmukhs hear when their Dasam Duaar opens up. Below is a very interesting story from Bhai Sahib's life, and that sheds a great deal on Anhad Shabads. This Saakhi has been taken from Bhai Sahib's book "Anhad Shabad Dasam Duaar". It's not a direct translation. Once a gursikh came to Bhai Sahib and started talking about Anhad Shabad. He said that he could now clearly hear the bell ring, sometimes the roaring of clouds and even a flute. He wanted to confirm his spiritual state with Bhai Sahib. Bhai Sahib in response to his question said that he did not hear any of these voices and sounds i.e. instrumental sounds. At this he got greatly disheartened. Bhai Sahib asked him what exactly he was doing while doing abhyaas. He said that he had a black dot on the wall for dhyaan (concentration) and he does one Siri Sukhmani Sahib paath looking at the dot. Then he kept his mind quiet and tried to listen to the five kinds of celestial sounds (as written by Yogis and Radhasoamis). After a while he started hearing faint sounds of ringing bells, waterfall, flute etc. The black dot too illuminated and this really motivated him and he started thinking that he was listening to Anhad Shabad. Bhai Sahib did not doubt what he was telling because Bhai Sahib knew that this person was telling the truth. Bhai Sahib told him that they would discuss this again the next day. That day at night Bhai Sahib sat in Smadhi and tried to hear the five sounds this person was mentioning. He could not hear anything other than Gurmat Anhad Shabad (Sifat Salaah that occurs in Sachkhand). From this high spiritual state, Bhai Sahib brought down his surtee to a much lower level and he was surprised to hear that all five sounds that the Gursikh had mentioned could be heard at different levels. Bhai Sahib has written that there was not even 1/millionth anand or bliss in these instrumental sounds as compared to the Gurmat Anhad Shabad. Bhai Sahib had never delved in these mystical realms since they were at a much lower level as compared to Gurmat Dasam Duar. Bhai Sahib came out of smadhi and immediately went to that gursikh who had asked this question from Bhai Sahib and told him that he was totally engaged in wrong anti-Gurmat practices. Bhai Sahib narrated to him about his experience and told him that little bit of concentration that he had was a result of Siri Sukhmani Sahib paath and he started hearing those instrumental sounds. Bhai Sahib said that these spiritual realms were lower than the lofty spiritual realms of Gurmat. Bhai Sahib told him that Gurmat Anhad Shabad is way superior to the 5 so called Anhad Shabads. From this saakhi of Bhai Sahib we learn that these five shabads that Radhasoamis talk about do exist but they are not attained by the way they work in it. Actually these five shabads are the invention or discovery of Yogis and RS has just adopted their theory. Gurmat does not believe in limited 5 shabads. Panch Shabad in Gurbani does not mean 5 Shabad but Panch means superior or greatest shabads. Gurmat believes in “Vajae Shabad Ghanaray” i.e. countless shabads and not only 5. Bhul Chuk dee Maafi jee. The above is based on Bhai Sahib's book - Anhad Shabad Dasam Duaar. the sounds help entice the surti to remain within, but we are still supposed to keep our focus on naam bani. that is how the two work together. You guys are great who are hearing the Naad. O gursikho, please give me your charan dhoor and bless this paapi banda also ! Good Katha on this topic by Maskeen ji. 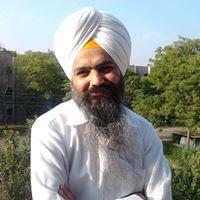 Please listen to Gyani Avtar Singh jee Badnikalanwale talking about Anahat shabad. Please listen after 12:30 min. With all due respect I'm sorry but I will have to disagree with that recording that ajapa jaap of Gurmantar or mool mantar is anhad shabad. There are countless references in gurbani to the actual sounds. When you hear even only one of them , it will shock your being and only then does one believe in their existence. Paaji, don't the sounds occur when one is at lower levels of spirituality, while the sound of Waheguru jaap is heard, when one enters into Brahamgyan (or is close to it)? Can you please elaborate? Don't think that Gyani jee has denied the existence of sounds. Paaji, I wouldn't be so quick to state Anhad is low levels of spirituality. Agree there are very basic sounds heard in the ears or head which may not be classed as True Anhad by various individuals, but one must be careful to not make bold statements claiming Anhad is nothing but early stages either. In the past and present I have on quite a few occasions heard sounds in my ears coming from near and afar, sometimes constant, sometimes harmonic. Yet I feel they don't have a kind of pull or any kind of intoxicating effect on me so I will not class them as Anhad yet. To others they may be on a scale of 1-10, stages 1 to 3. But if you ever experience stage 5 for example it does certainly startle you the first time you hear it. 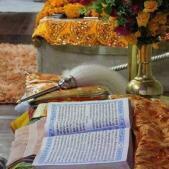 Anhad can occur in various forms and intensity at different stages right up to when at the abode of Waheguru. Take the few pangtis below on Ang 888. How can we call this stage for example where Anhad is heard early stage of spirituality? I believe this is not talking about some local sangat in a gurdwara. It is talking about very high avasta in the very deep inner realms where pure consciousness's are uniting close to the True Source..
panch sabad tah pooran naad. kayl karahi sant har log. They remain totally detached, absorbed in the Supreme Lord God. saadhsang bais gun gaavahi tah rog sog nahee janam maran. The love of God is their food, and the Kirtan of the Lord`s Praise is their support. They obtain a permanent seat in the infinite. By Guru`s Grace, some find this mansion. gur parsaad ko ih mahal paavai. bharam bhai moh na maa-i-aa jaal. They enter the deepest state of Sunn Samaadhi, through the kind mercy of God. I can't even comment on Sunn Samaadhi because I can't even get myself into basic Sunn beyond the 9 gates through abhiyaas. I can only hazard a guess to what it is like based on teachings I have heard. It's like when your in deep sleep beyond body consciousness and are awoken by only the intoxicating sounds of anhad music. Your consciousness is aware of nothing else but listening to this sound or voice of God because of its pure strength and intensity. I have only ever once in my few years on this path ever come close to experiencing anything like this and I could not withstand the intensity or knew at the time what it was. I wait for that call to come again, and I hope by his grace this time I can hold on a little longer without fear setting in and running in the opposite direction. I am not in the little bit qualified in any spiritual way to talk of Bhramgyan avasta or posess any such knowledge to even comment on where that begins. We are already discussing concepts way beyond our own practical experience which is based other peoples journeys. My advise dear brother is always look at where you are standing on the path in terms of experience. Looking too far ahead or at the final goal will definitely sound exciting but we as individuals are no where close to understanding such states. Yes it is encouraging and inspiring at times to look at those on a higher level to you but do spend time working on yourself also. A lot of the kathas and other materials on anhad were wrong and misleading if you remember Sat?... that's why it took ages to work out what was what and what we should be looking for. At last we can look into gurbani ourselves and have a much better idea of what something refers to. Sangat jee - Please note that the above is from a Larivaar katha of SSGGSJM. Usually in Larivaar kathas, Gyanis don't go very deep. Gyani Avtar Singh jee Badnikalanwale can probabaly talk about Anhad Shabad for days. It is clear from the post made by Sukrit Kaur jee (regarding Baba Randhir Singh jee) that sounds such as roaring of clouds, bell rings, flute, etc, occur at early stages of spirituality. Bhai Sahib jee had to bring his surti down to hear those noises. Daas does not think that a Gyani, who is a grandson of a Gurmukh Brahamgyani (Vidya Martand Srimaan 108 Sant Gyani Gurbachan Singh jee Khalsa Bhindranwale), spend years on Gurbani veechar, studied at a Taksal, most likely spend time with many Saints, etc, can get the explanation on Anhad Shabad wrong.